One Great SUV with 20 inch Factory Wheels, Near New Tires, Great Family SUV. One-Owner, Clean CARFAX. Navigation, Power Sunroof, Heated Seats, Heated Steering Wheel, Remote Start, Rear Back-up Camera, Bluetooth Hands Free, 4X4, ParkSense Rear Park Assist System, Heated Second-Row Seats, 3.6L V6 24V VVT, 20" x 8.0" Aluminum Wheels, 8.4" Touchscreen Display, For Details Visit DriveUconnect.com, GPS Antenna Input, GPS Navigation, HD Radio, High Pressure Tires Tracking, Integrated Voice Command w/Bluetooth, Power Sunroof, Quadra-Trac II 4WD System, Quick Order Package 23H, Radio: Uconnect 8.4 NAV, Rear-View Auto-Dimming Mirror w/Microphone, Roadside Assistance & 9-1-1 Call, SIRIUSXM Satellite Radio, Uconnect Access (RA4). 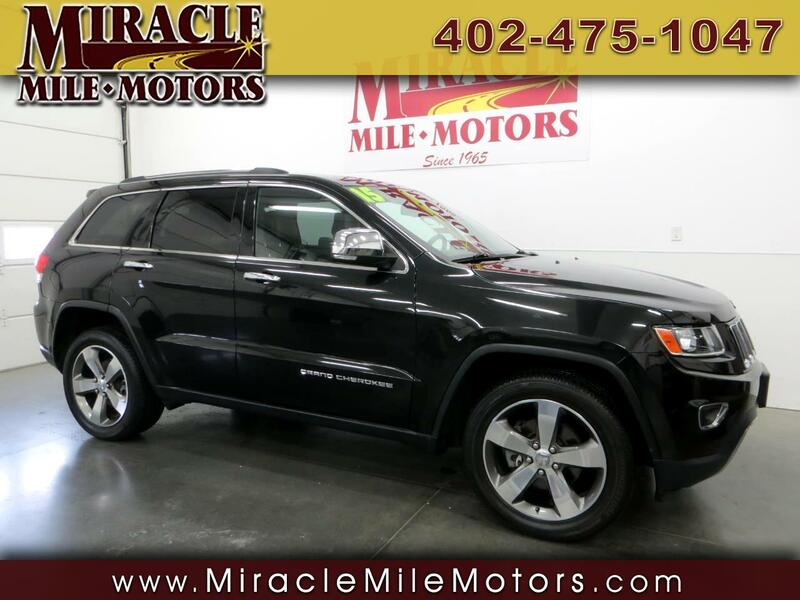 2015 Jeep Grand Cherokee Limited 4D Sport Utility 8-Speed Automatic 4WD 3.6L V6 24V VVT Miracle Mile Motors in Lincoln NE have been in business for over 50 years selling premium quality used cars, trucks and SUV's vehicles. We are committed to save you time and money and make your buying experience hassle free and pleasurable. All of our prices are clearly displayed on each vehicle. We offer bank financing , service contracts, and Carfax reports. NO DOCUMENTATION OR HIDDENS FEES. Word of mouth is our best advertising. Please look thru our inventory at www.miraclemilemotors.com or e-mail with any questions. 1-888-465-8963 87th & Hwy 2 Lincoln, NE 68526 Where Friends Tell their Friends to Buy CarS.